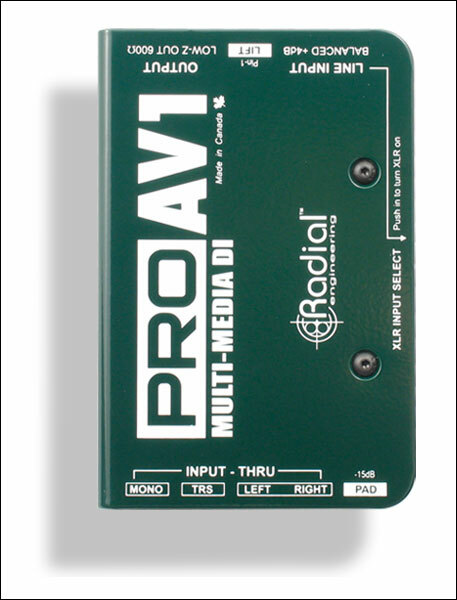 The ProAV1 from Radial Engineering is a passive direct box designed for multi-media applications with the audio-video integrator in mind. The unit features a variety of stereo inputs that are merged via a resistive mixer to mono, greatly simplifying signal management. To eliminate the need for various adaptor, a "Swiss Army" array of connections are provided, including 1/4" for instruments, RCA and 1/8" connectors for consumer electronics and computers and a +4dB XLR input for professional systems. The front panel connectors can also be used as thru-puts to allow multiple patch points. Custom wound transformers are employed that are able to withstand exceptionally hot levels while maintaining linearity from 20Hz to 18.5kHz. The resulting smooth Bessel curve is warm and natural, making the AV1 particularly adept at handling digital sources that can sound harsh. Transformer isolation adds the benefit of eliminating ground loops that cause audio hum and buzz and video hum bars or snow. The ProAV1 is ideal for events that interlace audio with video where music sources can include iPods, CD players and video decks.